Studded with the lovely verses of Walt Whitman, Chester Theatre’s I and You by Lauren Gunderson shines bright with the fine performances of its two young stars. When teenage Anthony (Paul Pontrelli) arrives suddenly in the bedroom of Caroline (Lilli Hokama) to work on a Walt Whitman homework project, he announces: “I and this mystery – here we stand!” As the two youngsters banter cleverly about the beauty and meaning of Whitman’s Leaves of Grass, they discover all that matters most in their own lives. Pontrelli and Hokama have a delightful rapport onstage, shifting from toss-it-all-off brittle teenspeak to adult level conversation with ease. They magic the audience along into their world like theatrical Pied Pipers, and are as believable in the dramatic moments of this play as they are in the comedic ones. Thanks to sensitive direction by Kristen van Ginhoven, this story about literature in counterpoint to life never lags in pace or interest. Walt Whitman’s poetry, interspersed throughout the story, always seems like song, beautifully performed - and the scene in which Anthony and Caroline share their favorite contemporary music pieces is an absolute jewel. One of the most enjoyable aspects of attending any Chester Theatre play is the outstanding technical/artistic production value, always present. 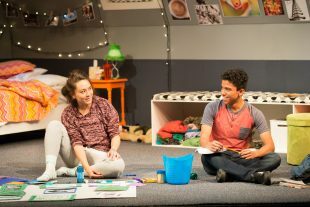 Juliana von Haubrich’s scenic design, for example, adds a whole other level to this transcendental tale: Caroline’s room is somehow suggestive of a teenager’s nest inside the space shuttle, complete with twinkling starlight. Lighting by Lara Dubin is evocative of what one might imagine seeing, traveling through the night sky, while Sound Designer Tom Shread complements the subtle celestial theme with some out-of-this-world sound effects. Chester Theatre Company’s I and You is aglow with surprises and delights, as well as poetry and fine performances. Journey to the hills of Chester to see it!